Strobe lights flash from every corner of the room, distorting your perspective of the undulating crowd that surrounds you. How did you get here? Sweat drips from your body, soaking your clothes and causing your hair to become matted. You really don’t remember how you got here? The floor rumbles, the bass shakes your ribcage, and you are tossed around the tangled mass of moving limbs. You try to remember, but the bass takes you . . .
House is a genre with countless sub-species; you’ve got your deep, acid, progressive, and tech renditions, all of which rely on the strength of driving bass-lines, but none highlight the low-end to quite the same degree as the charming sub-genre known as Bassline. Utrecht, Holland is currently dominating the bass-driven house scene, thanks to artists such as this one. 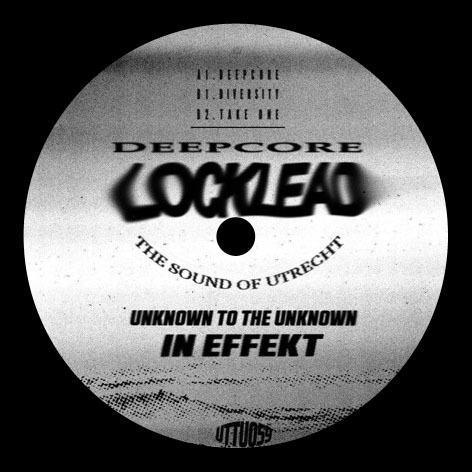 Deepcore is the newest release from Dutch producer Locklead. Three tracks are all this producer requires in order to stake his claim in the realm of dance music; three tracks overflowing with skittering garage house rhythms, colossal bass-lines, and subterranean atmosphere. Clinking bottles, MC shout-outs, underground rave synths, and sirens accentuate the pulsing instrumentation, adding a retro, crowd-pleasing quality without submerging the compositions in pastiche. Bassline (the genre) can be perplexing to a first-time listener; the heavy emphasis on drums and bass with a distinct lack in the melodic department, and the extreme subtlety in progressions can throw many for a loop. It’s normal to search for a standout vocal or lead melody, but attuning oneself to the bass will reveal the many treasures that this style holds. If you’re seeking bass-driven garage house, this album is for you.